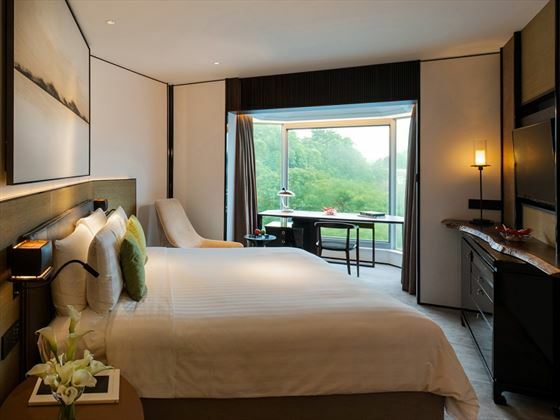 Consistently ranked as one of the top luxury hotels in Asia and the world, the Shangri-La Hotel, Singapore is where the legendary hospitality of Shangri-La first began. 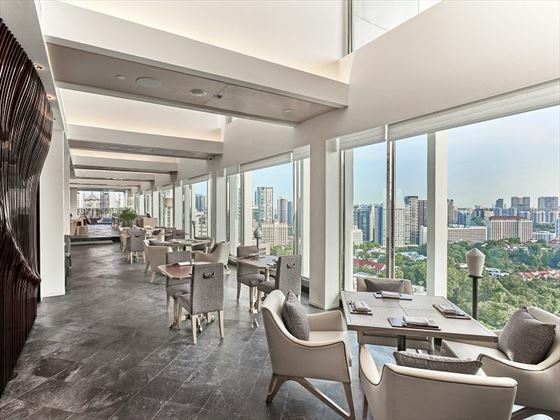 The hotel, which sits amid fifteen acres of luxuriant botanical gardens, is a short stroll from the main entertainment and shopping belt of Orchard Road. 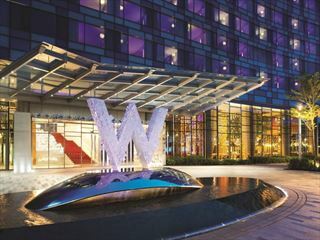 This luxury hotel in Singapore comprises 750 luxury guestrooms and suites in three distinctive wings: the contemporary Tower Wing, the tropical Garden Wing and the exclusive Valley Wing. All guests have use of our peaceful gardens, large free-form pool and world-class dining options. 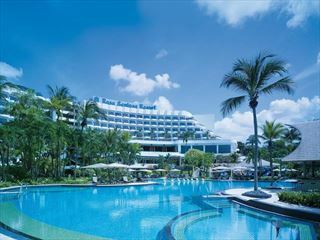 Our guest also enjoy signing privileges at the nearby Traders Hotel, Singapore and Shangri-La’s Rasa Sentosa Resort on Sentosa Island. Housing more than 133,000 individual plants, flowers and trees within fifteen acres of landscaped gardens, our gardens are a showpiece of ornamental flowering trees, aquatic plants, vibrant tropical flowers and shady fruit trees. It is also home to two hundred Japanese koi, in luminous hues of red and gold, who reside in ponds filled by tumbling waterfalls. A Garden Tour leaves the main Lobby in the Tower Wing every Friday morning. Attendance can be confirmed with the concierge. 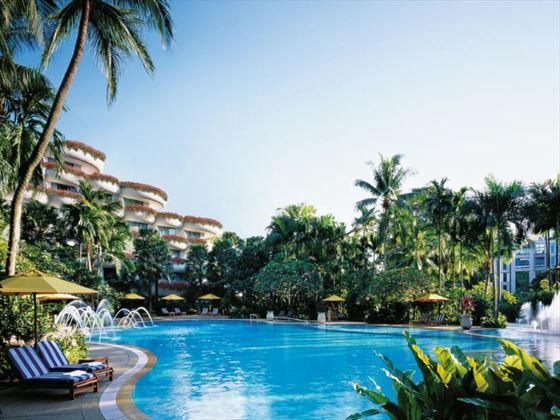 This luxurious resort boasts 15 acres of luscious gardens, painting a beautiful backdrop for its three main buildings. Just a short walk from Orchard Road with its vibrant shopping and restaurant scene, your stay can be as serene or as lively as you please. 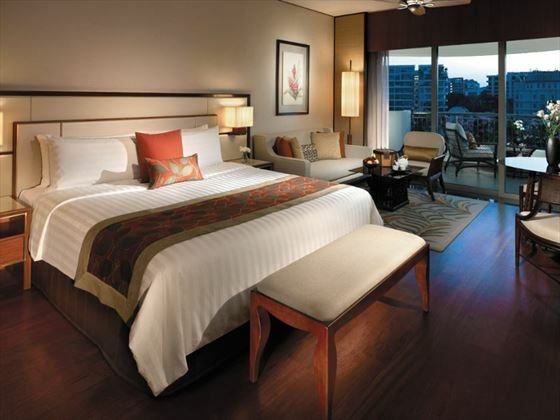 The Shangri-La Hotel, Singapore comprises 750 luxury guestrooms and suites in three distinctive wings: the contemporary Tower Wing, which features spacious rooms with enclosed balconies, the tropical Garden Wing, which overlooks the tropical atrium and swimming pool, and the exclusive Valley Wing, which has a private entrance and reception, and offers our highest level of Shangri-La service and elite appointments. 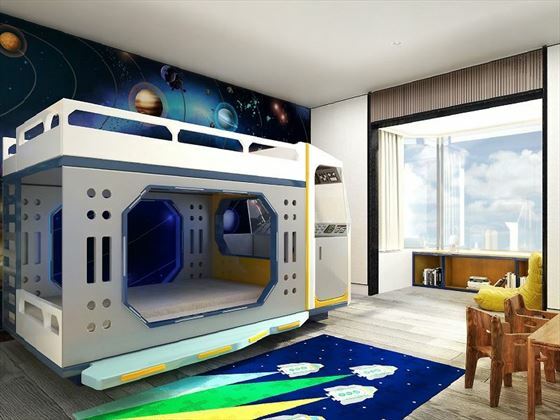 Themed Family Suite: Designed to cater children aged 3-12 years with their own tunnel access between adjoining parents rooms. 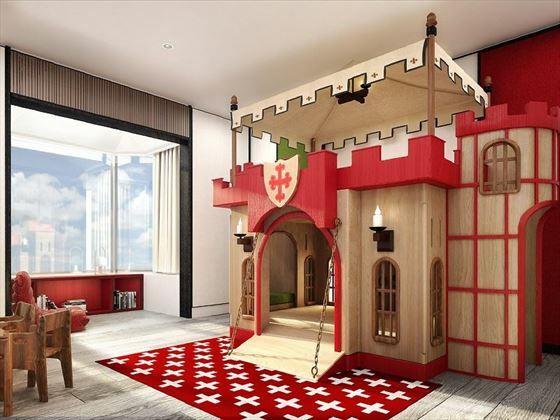 Themes include; Castle, Space, Underwater, Safari and Treetop. 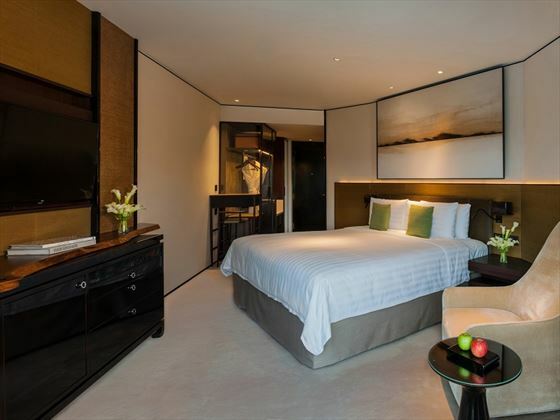 Complete with two bedrooms and two bathrooms in 72sqm, it can also be connected to a Deluxe Family Room in order to cater for larger families. 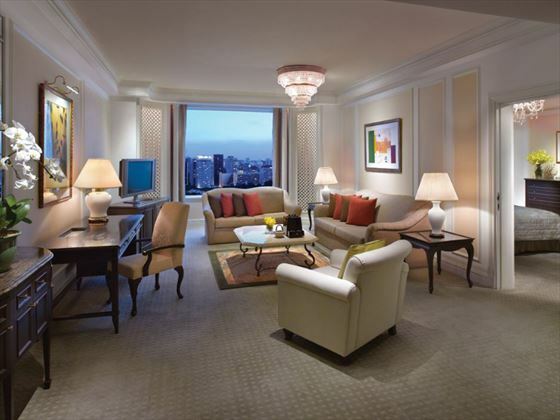 In-room check-in is available with these suites for an effortless arrival. 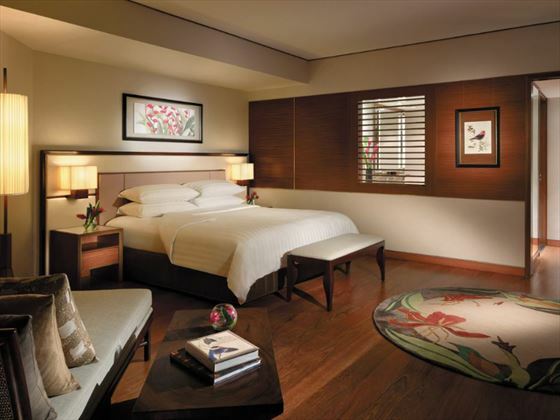 All rooms offer complimentary in-room broadband internet. Horizon Club rooms offer an enhanced level of service, comfort and convenience for busy travellers, including a purser service. 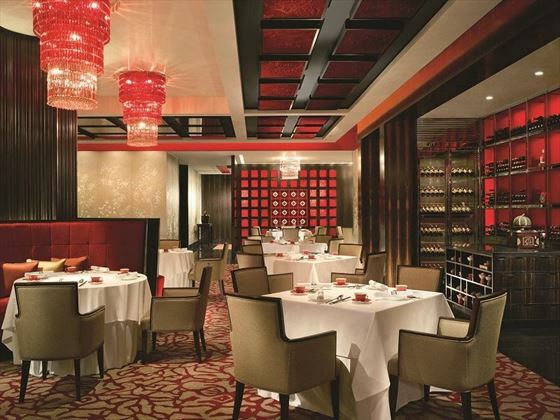 Shang Palace: Cantonese at its very best, Shang Palace offers a wide variety of exquisite Dim Sum and an extensive array of a la carte and set menus. 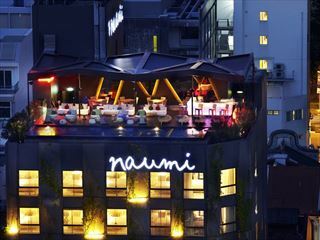 Their team of chefs are renowned for creating classics with a focus on healthy cooking. Rose Veranda: The charming Rose Veranda offers an elegant Afternoon Tea experience with 101 varieties of tea served on Wedgwood tea sets and a lavish spread of delectable English and Asian delights. Lobby Lounge: An ideal meeting place, this lobby indoor garden setting serves light snacks and an impressive range of wines, liqueurs, cocktails and other beverages including the Cheongsam, Shangri-La’s signature cocktail. The Line; surroundings and stylish bites make this all-day dining restaurant the place to be. 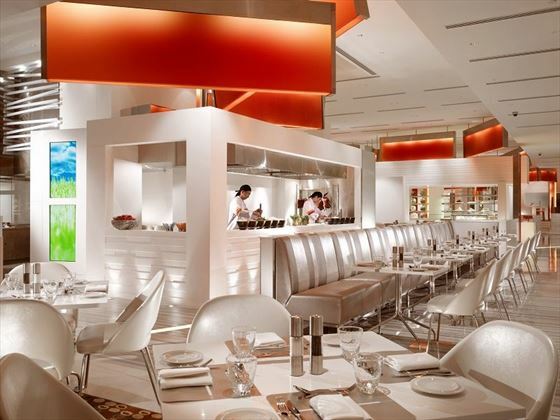 International cuisine is featured over 16 culinary stations while the Bar offers a large selection of premium wines, juices and smoothies for the health conscious.